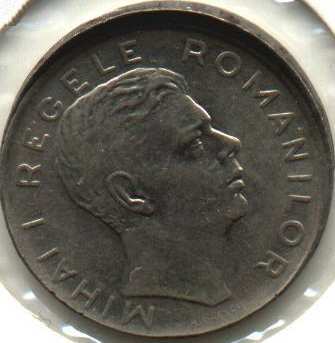 denomination "100 LEI" and year 1943 inside a wreath formed by a laurel branch (left) and an oak branch (right); crown inscription "MIHAI I REGELE ROMANILOR" meaning "KING OF THE ROMANIANS", MIHAI I head to the right. Under the neck lies H. IONESCU, the engraver's name. In 1943 were struck 40.590.000 coins and in 1944 other 21.289.446 coins. 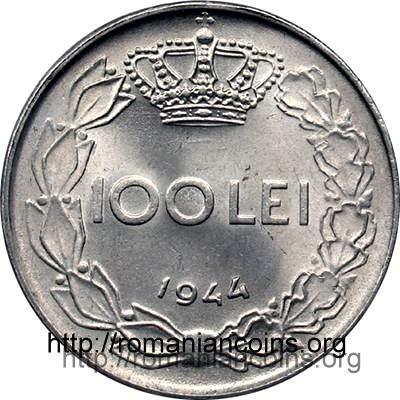 After the book Monetele României written by Octavian Iliescu and Paul Radovici (Coins of Romania, 2004) coins of 100 lei bearing the year 1944 were struck also in 1945. These coins were struck on nickel-plated iron planchets. The planchets were made by the German company Vereinigte Deutsche Metallwerke AG (VDM) at Altena, a city from North Rhine - Westphalia. The plant of Altena was specialized in nickel metallurgy, and most probably here were melted the 50 and 100 lei nickel coins issued in 1936-1938 and withdrawn from circullation. The recovered nickel was partially used for plating the mentioned iron planchets, the rest having been used by the German industry. 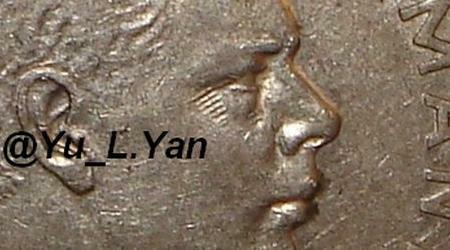 The inscription on the edge can take various positions respective to the faces of the coin. It can start from anywhere and can be laid on the obverse or on the reverse. This observation is true for all the incuse inscriptions or ornaments on the edge of the Romanian coins from the beginnings up to present (2010). In the image above are pictured the marks that separate the words NIHIL, SINE and DEO. 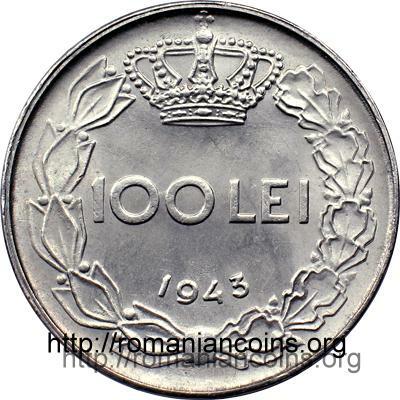 The same signs were used also for the 10000 lei 1947 coin. 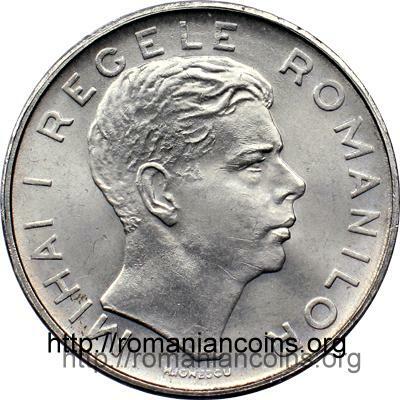 The pictures of 100 lei 1943 and 1944 coins above are present on Romanian coins through the kind permission of an anonymous donor. 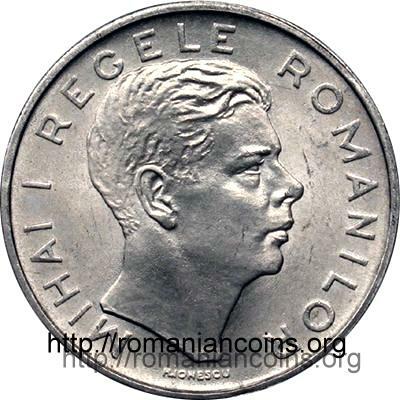 The picture and the text above - written in italics - are present on Romanian coins through the kind permission of Mr. Radu Lissner. 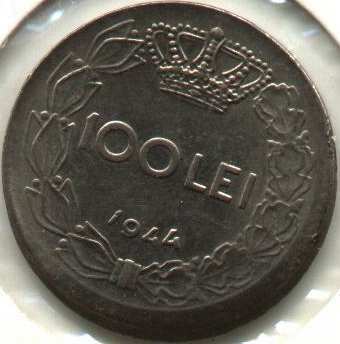 The effigy variant of the common 100 lei a.k.a. "Mihai with wrinkles" exists and there is no doubt that it is the result of an intentional changing of one of the dies used for the 1943 coins. 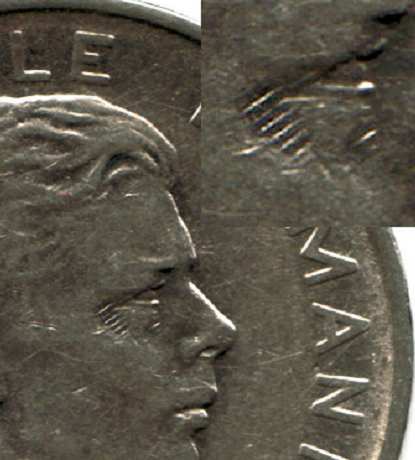 These "wrinkles" are in reality 8 clear, distinct and parallel notches, made on the regular die, so that on the coin they appear as prominences. Thus there are 6 prominences at the canthus (the corner of the eye), parallel with the line that marks the upper eyelid and two towards the nose, smaller, unequal, but parallel with the first. So, it is obvious that these prominences do not represent fissures or other die flaws (in this case the prominences can not be parallel, being irregular), but an intentional changing made by the engraver. The significance of these coins is intuitive, though it is only pure speculation: it seems very possible that the engraver H. Ionescu expressed in this way (very discreetly) the great concern that the young king faced in that year of major strain for Romania - 1943. 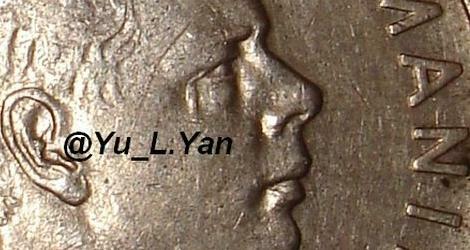 In the pictures below (presented on the site through the kind permission of Mr. Yu_L.Yan) are another piece with wrinkles and one with teardrop. On 100 lei - Mihai with teardrop - in the corner of the eye is placed a "tear"-like prominence on the effigy. Just below there is a struck error appeared as result of a blank shift respective to the die. The images are present on Romanian coins thanks to the kind contribution of Mr. Moise Alexandru-Rãzvan.